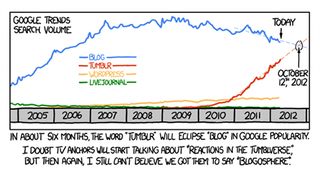 The Blog Is Dead; Long Live Tumblr! Judging by Google popularity, the word "tumblr" will be a more common search term than "blog" before the end of the year. Welcome to the future, where the majority of web sites sound like band names.